Firstly, you need to know I am not a huge ‘brush user’, especially when it comes to foundation. I use everything I should but, quite minimally, meaning I don’t really fuss if I am missing something but, seeing the real techniques collection kit on sale I just had to go for it and become part of the gang. First Impressions Of The Core Collection? I was obviously super excited, i couldn’t wait to tear open the packaging and try the brushes out. I know this will sound a little strange to regular brush users but, I wasn’t over the moon with the white carry case it came in. It seemed a little flimsy and like it would get dirty quite quickly… I know this seems pretty petty but it was just something I noticed and hopefully am not the only one! Even so, I caressed each brush and one by one tried them out over the week to see what they were all about. First I marveled at how soft it was.It’s so soft. Like extremely soft. I loved that about the buffing brush. It’s also really easy to hold and use because it does have quite a thick base, it doesn’t soak up too much product and overall it applied my powder better than it had been applied it quite some time! It’s a great brush if you’re using wet concealer (is that the right term?!). It blends beautifully and it covered up all of my imperfections flawlessly, its definitely a favorite of mine out of the core collection kit and will probably get the most everyday use. I didn’t think I would like how small the brush head actually was but it came in handy when blending out concealer around my nose and eyes. It’s really great and I would recommend it if you’re looking for something to cover red marks or blemishes! I hate to be too critical but this brush is probably my least favorite. I’m not a fan of foundation brushes as it is, for no reason except I don’t feel like they give me much coverage and I am a full coverage kind of gal. Of course not everyone is like me so I just put that down to personal preference. The pointed foundation brush just wasn’t really for me which is quite sad considering how nice the other brushes are. I will use it to blend out foundation around my forehead and neck because it looks natural but, I can’t see myself using it to actually apply my foundation. 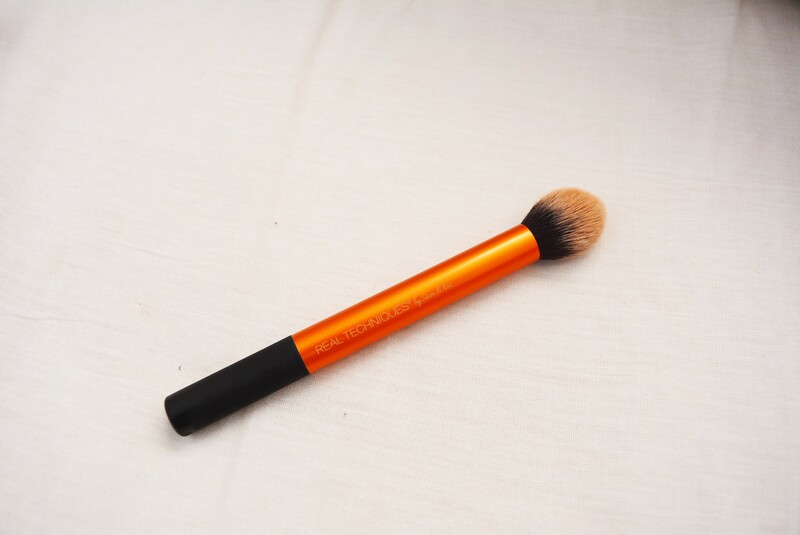 You can probably tell from how dirty it looks in the photos how much I loved this contour brush. It’s easy to use and really gets in to the areas I need it to go. It didn’t work quite as well blending out my stick contour but powdered contour and easily blendable contour it worked flawlessly. It’s the perfect size and I am so glad they included it in this kit. Just like the others it’s soft, easy to use and doesn’t pick up too much excess product. I am glad I bought this kit. It’s the perfect size to travel with or just keep in your makeup bag and it means I can now experiment with makeup brushes. I did also like that you could make the case stand up for easy access to the brushes but, it did stupidly take me a while to figure out! I loved each brush in its own way and although not disappointed because it was my own choice, i was a little sad that I didn’t get on with the foundation brush or the white packaging because I could of given the kit a higher score. Sorry to anyone that loves both of these things but its just my own personal thoughts and something I have to share. The core collection kit is also quite cheap. Considering some of the prices makeup brush companies are charging at the minute, I think these brushes aren’t too over the top. The core collection kit is worth the money. I don’t think it would matter if you were new to brushes like me or a an avid user of makeup brushes. Each brush has its own unique style and unlike a lot of other makeup brush kits you can clearly differentiate which brush does what, no two are alike. I hope you enjoyed this real techniques brush review, if you did please let me know in the comments below and let me know your thoughts! Matte Lipstick Review -Must Read Before You Buy! ← Previous Story Soap & Glory Sunkissed Tint Body Lotion Review – Must Read! Hi there, I read your new stuff regularly. Your writing style is awesome, keep it up!